Below, left is a painting by Salomon de Bray of Samson with the Jawbone (1636, oil on canvas, 622mm x 508mm). 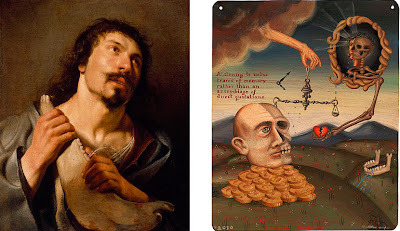 I've used this symbol in my painting on the right, called Measured Sadness, as this for me, reinforces the multiplicity of meanings in the symbolism of historical art and the signifiers I use in my paintings to re-interpret my historical interests, while still trying to push forward. Everything means something, yet it can still act like mercury - reforming itself constantly. I'm not so much interested in the posterity of my work, but from the other direction - time often changes meaning.